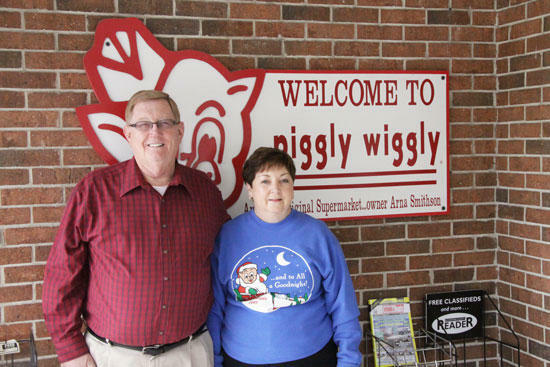 Arna and Teena Smithson have welcomed shoppers to the local Piggly Wiggly for many years, but that will end with their retirement and selling of the store, effective January 1. Cannon Countians who shop locally at Piggly Wiggly have grown accustomed to certain assurances for the better part of almost four decades. They have come to expect fair, competitive prices, quality products and Arna Smithson’s smiling face, but after 39 years in the business, Smithson is retiring and selling the Piggly Wiggly in Woodbury. Jim Myers, who owns three Piggly Wiggly stores, as well as a Save-A-Lot, will purchase the Woodbury Piggly Wiggly from Smithson, effective Jan. 1, 2012, Smithson has announced. “I feel like now is the time to do it,” says Smithson, whose family has been in the grocery business in Woodbury since 1946. “The main thing I will miss is our business is our customers. We have been here so long you almost know which day certain customers will be coming into the store. You are going to miss those people. I don’t know that I will miss the grocery business, but I will miss the customers. Customer service always has been at the top of Smithson’s list – a quality learned from his dad, Coy, who started in the grocery business in 1946 in the Woodland community. Coy Smithson later moved his business to Woodbury, where he would operate out of three different locations. Under Smithson’s watch, Piggly Wiggly became more than a local grocery store where people purchased good. It became an institution in the community and much of that has to do with the manner in which Smithson supported the local schools system. Indeed, Smithson’s Piggly Wiggly has done more than provide a service for its community. The store has provided numerous opportunities for young people who may not have otherwise enjoyed them. Smithson’s Piggly Wiggly has supported sports teams in the schools, various clubs, grammar school harvest festivals, community organizations and events, individuals raising money to attend a seminar or national convention, as well as individual benefits for someone who may have lost a home to a fire or became too ill to work and could not afford groceries. Smithson’s good will was recognized last May when he was a member of the first Cannon County Hall of Fame induction class. He went into the Hall of Fame as a contributor. Arna and his brother, Adron, purchased the grocery business from their dad in 1972 at the location in the Hancock Shopping Center on South McCrary Street, and then moved into a new store in Woodbury Center under the name of Big Star. When Adron’s health began to decline, Arna and Teena purchased his interest in the business in 1985. They then bought a franchise from Piggly Wiggly and have operated the store under the name since. In all, Arna and Teena have been in grocery business 39 years and the family was in the business for 65 years. Smithson has been in business long enough to have had three generations of a family work at the business – Bonnie Estes, son Jeff Estes and granddaughter Kelsie Estes. Mike Vance, his three children and a niece also worked for Smithson. Treating people the way he would want to be treated enabled Smithson to enjoy a long run in the grocery business in Woodbury. It also landed him Piggly Wiggly’s highest honor. Arna Smithson was the recipient of the Clark Saunders Award for the 2001 Operator of the Year. The award is based on increase in sales and longevity of employees. Out of more than 1,100 stores, Smithson’s was best. Smithson also has seen major changes in grocery business through the years. Arna may be retiring, but he says Teena already has plenty for him to do. Smithson may be retiring but the longstanding relationship he developed with Cannon Countians through many decades will be a lasting legacy. May you enjoy every day of your retirement and may they turn into many years of true enjoyment and contentment. You deserve it. Thanks Arna for all the many wonderful years you have provided food and service to the people of Cannon County and for sponsoring all of those kids and supporting our teenagers with jobs! The way you ran your business is a model for everyone else to follow! I remember Big Star / Piggly Wiggly was the only place to go when the forecast of snow was on the way! It was almost impossible to get in the door with all the people inside buying bread and milk like we were all going to be trapped for days with no way to get food! Enjoy your retirement and have a very HAPPY NEW YEAR! Thank you for the way you treated your customers and for the many jobs that you have provided through the years. Thank you Arna and Teena for the fantastic positive impact you have had on the lives of so many Cannon Countians. You will be missed. Enjoy your retirement and best wishes from all your Cannon County friends.